Gluteus injuries are often caused by overuse, hip misalignment, muscle imbalances, sitting or standing for extended periods of time, or abrupt changes in training. Put the area on stretch by leaning forward. 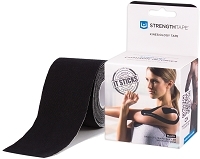 Anchor StrengthTape directly above the point of pain, with no tension. Stretch StrengthTape 100%, back it off halfway, and then halfway again to equal 25%. 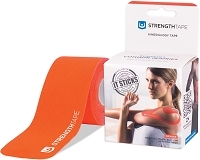 Without touching the adhesive, use your finger to gently lay the rest of the tape down across the area. Apply the second strip directly below and parallel to the first. Repeat steps above. Once again, it’s important to remember to avoid touching the adhesive.